*Whimsical Rabbits are movable public art pieces that the community can engage in. 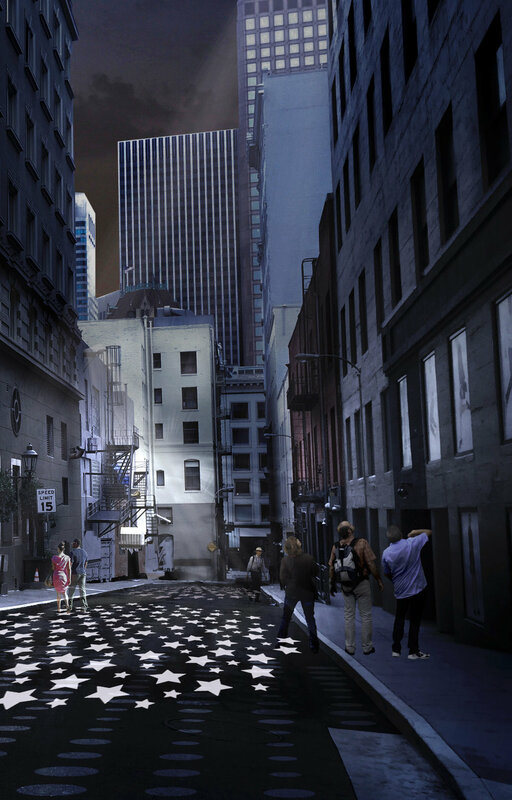 *A light projection show could inspire a healthy nightlife in Union Square. Campton Place is a backstreet connection between Stockton Street and Grant Avenue, located mid-block between Sutter and Post Streets. The street currently has service access to multiple businesses, limited metered and commercial parking spaces, and three restaurants (two occupied and one vacant) with doors onto the street. • The street has high potential as an active pedestrian way due to its location and the businesses that open onto the street. • Recently, the street has received funding through the City grant process from Groundplay and a Community Challenge Grant specifically for a neon light art project. Updates on the neon light project will be coming soon! The Union Square Foundation is seeking additional funding for programming and beautification needs.